I teach classes on how to make this Wonky Star Quilt. This is a really fun way to make stars. Both Gwen Marsden (Liberated Quiltmaking)and Jan Mullen have encouraged this wonky star quilt method through their books. What a fun method for making stars! There are no intricately cut corners, and no perfectly matched points - its time to get creative!!! You can also use this method to create other shapes, like hearts, dolls or teacups. 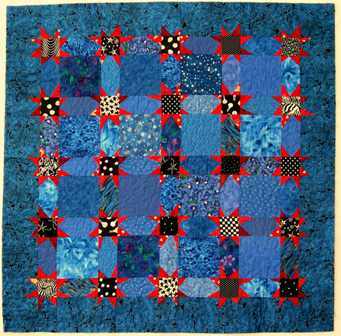 Jan Mullen has a whole series of (Stargazey) patterns available for a variety of projects. Fun stuff - give it a try! Wouldn't this quilt be beautiful in soft pastel florals, or wild bright kids prints? In a six hour one day class you will finish a small wall hanging or start on your larger quilt. If you or your group wish to take this class during a retreat Contact Me for more information or reservations. Finished with "Wonky Star Quilt?" Return to "Classes I Teach"